The earliest history of the school dates back to Civil War Brigadier General Paul Ambrose Oliver, whose heirs donated the land for the original Oliver School in Bear Creek Township. Brigadier General Paul Ambrose Oliver was born July 18, 1831 on board the ship Louisiana, in the English Channel under the United States flag. General Oliver obtained his education in Altoona, Germany. He went to New York and there engaged in the shipping business, and later in the cotton trade with his brother, George W. Oliver, in New Orleans and New York. His residence was at Fort Hamilton, New York, and when the yellow fever broke out there in 1856 he organized the Fort Hamilton New York Relief Society, of which he was made president. At the breaking out of the Civil War he enlisted on February 27, 1862, in the 12th Regiment, New York Volunteers, as second lieutenant, Company E. Throughout his distinguished career, he received many promotions and served in engagements at Bull Run, Antietam, Fredericksburg, Atlanta, Appomattox, Yorktown and Chattanooga. He received a Medal of Honor from Congress May 16, 1862, for distinguished serve at Resaca, Georgia. He was honorably discharged from the service in May 1865. Upon General Oliver's death, his estate was divided between family members as part of his last will & testament. 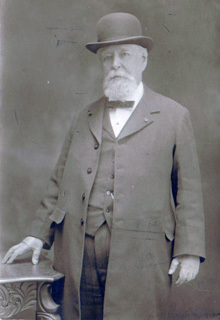 During the 1880s, General Oliver purchased 1,200 acres of land in Bear Creek Township spanning from Barney Searfoss' road in Trailwood to Hairpin Turn. In July of 1929, Adelaide Bonnell, Mary Bonnell, and Russell Bonnell donated 4.55 acres of land, once part of Oliver's Deep Bottom Farm, to the School District of Bear Creek Township. As a covenant of the deed, the Bonnell's insisted that the land be given for the purposes of a public school building and playground, and shall revert to the Bonnells or their heirs, if, and when it is no longer used for such purposes. The original school building was constructed as a project of the Work Progress Administration at a cost of $13,000 to the school district. In 1936, three additional classrooms were added. A 229-foot artesian well provided drinking water. 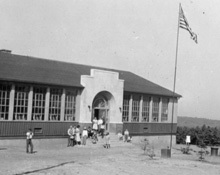 The school was dedicated on May 5, 1937. In May of 1957, the property was conveyed to the State Public School Building Authority, and then to the Wilkes-Barre Area School District in February of 1980. The school was given the name Oliver School after General Paul A. Oliver, until 1970 when it was renamed the Bear Creek Elementary School. The Bear Creek Elementary School, or as it was known historically, Oliver School, officially closed on August 23, 2002. Ownership of the property then reverted to Mrs. Gail Popple of Bear Creek Township, who maintained ownership interest in the property. Thanks to Mrs. Popple's generosity, the former school and surrounding property have been provided to the Bear Creek Community Charter School. Mrs. Popple's dedication to the local community will allow the tradition of a quality, locally centered education that was envisioned by the Oliver Family more than seventy years ago will continue, and new life has been infused into this historic facility. Bear Creek Community Charter School opened on September 29, 2004 as the first and only public charter school in Luzerne County. Not long after opening in 2004, the School’s Board of Trustees recognized the need for a long-range facilities plan, and immediately took action in pursuit of a new school facility. In partnership with the Bear Creek Foundation and the United States Department of Agriculture, land was acquired, financing secured, and a new school campus was designed. On January 4, 2016, the new Bear Creek Community Charter campus opened at Ten Mile Run in beautiful Bear Creek Township. Consisting of 307 acres, the new campus includes 63,000 square feet of modern educational space, full size gymnasium, maintenance facility, and outdoor amenities that support the School’s mission of inspiring student success. Civil War Brigadier General Paul Ambrose Oliver. Oliver School during the earlier days. The dedication of Bear Creek Community Charter School, September 2004. The new Bear Creek Community Charter School at Ten Mile Run. Copyright © 2018 Bear Creek Community Charter School. All rights reserved.